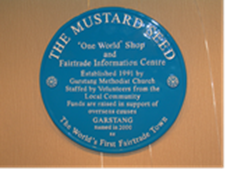 The Mustard Seed is a 'One World and Fair Trade' shop at Garstang Methodist Church, and we are proud of the part it played in Garstang becoming the 1st Fair Trade town and still plays in promoting Trade Justice. Ever since it started the vision of the Mustard Seed has been to promote awareness of the plight of third world communities struggling to overcome poverty. It was the inspiration of a former minister the Rev. Peter Haywood in the 1990's to convert part of the premises into a shop. The members of the church, helped by others from outside interests were inspired and motivated that in September 1991 they opened a small shop, a comfortable place to meet where refreshments and fairly traded goods from around the world could be obtained. The shop is staffed by volunteers and is open three days a week. We still need more volunteers. The name of the shop was chosen to reflect the Bible passage in Matthew 13: 31 - 32 when Jesus said "The kingdom of heaven is like a mustard seed, which a man took and planted in his field. Though it is the smallest of all seeds, yet when it grows, it is the largest of garden plants and becomes a tree, so that the birds come and perch in its branches." This is true today as the shop has grown and developed into a recognised place for providing fairly-traded goods from a wide range of producers. The benefits are two-fold providing a Church community and outreach for people in Garstang and the surrounding district, and importantly the Mustard Seed has enabled poverty stricken communities to be supported and empowered to live independent lives. In 2006 the Church premises were refurbished and modernised and Wesleys Coffee Lounge took on the role of refreshments and outreach to the community. It is a bustling place to meet and visitors can enjoy a selection of fair-trade refreshments in a relaxed environment and browse and buy from the Mustard Seed too. In the first few years, all profits were ploughed back into buying stock but now, after twenty four years well over £25,000 has been passed on to various organisations, charities, schools, communities and co-operatives around the world - helping craftsmen and women to have a future in their homelands! Our latest donation was toward Ebola crises relief in East Africa. To mark the occasion of twenty years as a 'One World and Fair Trade' shop in 2011 special events took place throughout the year culminating in an anniversary meal at the Crofters Hotel, Garstang. In commemoration a colourful rag-rug was presented to the Mustard Seed made by a local group of crafters based at 'The Centre' Gt Eccleston, Lancashire. NB! We also support Local Farmers and Local produce whenever possible. > We like to support local Churches and local organisations by offering stock to satellite stalls. We can offer a selection of goods on sale or return for your church stall. > We are willing to place orders with Traidcraft on your behalf if we don't hold the products you would like. and many other direct contacts with overseas communities.